A show dedicated to teaching you about discovering your God given purpose and destiny. Each week, I provide great nuggets of information that will help you walk in God’s will for your life. I also bring on special guests that talk to you about their purpose, so you can see how they discovered theirs! New episodes will air May 2019! The Purpose is for ALL Podcast! I ask guests five questions in five minutes about their purpose and destiny! The podcast is available on Anchor radio, iTunes/Apple Podcasts, Google Play, Google Podcasts, Spotify, Pocket Casts, and more! Listen to Season 1 of Purpose is for ALL Podcast! Listen to Season 2 of Purpose is for ALL Podcast! Listen to Season 3 of Purpose is for ALL Podcast! Click on the name to hear the episode! New Episodes every Friday at 9:00am CST!! Watch the TV show Below and/Or on My youtube channel! New episodes will debut May 2019! 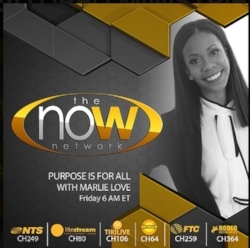 Watch Purpose is for ALL on the NOW Network Here: NTS Communications channel 249 (TX, LA) NK Telco Cable Ch.64 (CA & TN), LiteStream Cable Ch.80 (FL), TikiLive Cable Ch.106, FTC Ch.259 (SC), & Rodeo Network Ch.364 (WA, MO,TX ,KS & MI). We can also be viewed on our FREE Mobile App, ROKU Channel, KlowdTV and 24/7 Online Streaming at theNOWnetwork.org. NEW! Do You Want to be a special guest on Purpose is for ALL Podcast? Fill out the form below for more information. Guest spots do cost. The cost is only $25 to be on the PODCAST. You must be able to pay once approved to be on the show.